15 Popular Business Intelligence Software Solutions: Which One Is The Best? Business intelligence (BI) is no longer the realm of multinational companies. Thanks to BI solutions, even small businesses today can process volumes of data and visualize insights of them. These insights can give companies competitive advantages, including new customer leads, identifying resource leaks, and optimizing resources. In this article about the top business intelligence software solutions in the market today, we focused on key elements that make each BI system great. They include: ability to process data powerfully and generate them in clear visuals; ability to share insights via collaboration tools; and integration with other systems considering huge volumes of data will likely come from different platforms in different formats. Read through our list of top business intelligence software solutions below and what reason we found to include them. They are a motley mix of open-source, proprietary, and freemium solutions to give you a more flexible choice depending on your individual needs. What are the 15 popular business intelligence software solutions? All our top five BI solutions offer a comprehensive suite of communication, collaboration, smart visualization, integration, and data warehousing features. However, Sisense stands out from the crowd because of its ability to process terabyte-scale analytics fast. Using a 64-bit computer, parallelization architecture, and multi-core CPUs, it can surface insights from the most disparate datasets in seconds. It is also a powerful BI system that has a very simple UI designed for non-technical users. Pricing plans for the software are flexible and should suit both small businesses and large enterprises. There is also a great free demo plan that allows you to test the software’s capabilities and see how profitable it can be for your company. You can easily sign up for Sisense free demo here. If you’re hosting terabytes of data, you need an optimum system like Sisense to avoid computing crash that, in turn, causes delays. The software uses an In-Chip engine and Crowd Accelerated BI technology that can prepare answers right when a query is made. CPU power is consumed only when needed; thus, optimizing system performance. This also makes Sisense ideal for commodity servers, slashing down your capital costs significantly. We find its drag-and-drop interface key to successful user adoption. Even non-technical analysts can tinker with its business intelligence tools immediately. We were able to create clear charts plotting our data after playing with its myriad visualizations. Sisense can also run simultaneous tasks such as data modelling and calculating complex sets. After visualizing data, sharing it is likewise easy. The dashboards are web-based and accessible on any device. Anyone accessing the insights are using the same source, which ensures data integrity and real-time information. You can also customize access via different user levels. Sisense is also great at integration. We linked it up with Google Adwords and were able to import our campaign metrics without trouble. The BI solution also works well with other business apps like Excel, Zendesk, and Salesforce. This, in fact, allowed us to view data even in different systems. Other significant benefits of Sisense include: ability to embed individual widgets in dashboards; eye-grabbing visualizations; and intuitive script-less user interface. We find Looker a BI software with great collaboration tools. It helps you deploy data apps across the organization so you can pull together data silos in different departments, such as, sales, support, logistics, and e-commerce. Looker is best to help myriad teams use organizational wide data to address their respective issues. The interface and navigation is easy for non-tech users. A team leader in one department can quickly build a report and share it with a leader in another department without tech support. You can nurture a culture of, not only an exchange of information, but of insights among your teams. It’s easy as we discovered. Looker offers self-service tools, such as, filtering, pivoting, and visualizations, and its dashboards give analysts a quick, clear glance at insights. Furthermore, Looker is compatible with any web browser and mobile device, allowing greater mobility in collaboration. Remote teams can also use XLS, TXT, CSV, and Google Docs files with the BI software. For data warehousing, Looker integrates with SQL or other platforms like Greenplum and Amazon Redshift. You can easily sign up for Looker free demo here. If your business largely involves clients, suppliers, or key partners in assessing your company’s analytics, GoodData is an option. Its architecture is focused on delivering data extrapolation not only across your organization but also to external teams. Companies with a number of subsidiaries will also benefit using this BI software to share data-driven reports throughout their business network. The vendor claims over 40,000 business in as varied industries as healthcare, e-commerce, retail, and tech are using this software. Once the tech team set up data sources, analysts from different departments can work their way through GoodData even with little or no technical help. Eventually, managers can manage the whole data pipeline, from integration to ETL, analytics, and visualization. Moreover, we find the Collective Learning a useful tool. Managers can share their unique cases, while department heads can collate the best practices. As your leaders become proficient in unearthing insights, your company becomes more agile and you, as a C-level executive, can make better and faster decisions to allocate resources, align goals, and boost profitability. Domo is a general but comprehensive BI software with standard analytics, collaboration, and dashboard tools. It has two capabilities that are worth highlighting. First, it has a strong emphasis on social collaboration. Conversations, context, interests, and behaviors can be mashed with data to reveal insights. Second, like our top BI solutions, Domo lets you visualize data in myriad ways–graphs, bars, charts, etc.–to look for trends, patterns, and gaps. Another great feature of Domo is its open-source platform. It offers a set of developer tools and APIs that let you build your own apps within the ecosystem. Likewise, you can integrate with third-party apps using the Domo’s Appstore. If you have a tech team, this software helps you to maximize their full potential. Domo also has a great mobile web version and native apps for Android and iOS. Other great Domo benefits include: creating your dashboard UI; project management; and an integrated communication and messaging platform. Rounding up our top five BI solutions, Tableau is another comprehensive software with powerful analytics. It is targeted at the largest enterprise, but its $500 per user per year price point may work well for medium companies, too. It can handle huge volumes of disparate data as Sisense, our top choice, from different sources within the company. Although the vendor claims it can be 100 times faster than other solutions, we take it with a grain of salt. Against our top performers in this list, we didn’t find a significant difference in terms of data mashup and generating reports. This claim may be against the lower-end BI solutions. KISSmetrics is a BI solution focused on web analytics. It is ideal for marketing to identify which online channels give the best ROI. Its Power Report, for one, can help you compare marketing channels across your verticals or web referrals. With this BI software you can more effectively target repeat customers, their sources, and even rate them based on purchase so you can allocate more resources to your top customers. KISSmetrics, however, is not a comprehensive BI software. It lacks the collaboration and customization capabilities of our top five solutions. Still, it is arguably one of the best options in web analytics, its core territory. It can greatly enhance lead generation campaigns. For instance, you can track web visitors and their activities, sort them out, and develop campaigns to funnel each visitor type down the conversion phase. You also get a lot of unlimited options with KISSmetrics, including: funnel, cohort and retention reports; customer profiles; group contact lists; and A/B test reports. Cyfe is also a good BI software for web analytics to help you monitor your different online assets and conduct campaign based on data intelligence. It supports your sales, marketing, finance, and customer service by giving you insights from data collated across your multiple websites, social pages, and other online points-of-contact. But similar to KISSmetrics, Cyfe lacks the comprehensive BI tools like collaboration, customization, and internal data mining. This makes Cyfe mainly ideal for ecommerce or companies with vested online interests. The intelligence software is visually oriented; it uses clear, neat dashboards to present insights and reports. Likewise, it has great integration including pre-built widgets from popular apps like Google and Salesforce. You can expand its functionalities by mashing it with other analytics apps, such as Alexa, bitly, AWeber, and select accounting solutions. Other notable features include: API support; branding label; real-time report; and data exports of standard formats (CSV, PDF, JPEG, and PNG). Similarweb Pro also has the same specific use as KISSmetrics and Cyfe: web analytics. It is also most ideal for businesses in ecommerce or online services. The software can pull insights from any website and app–including your competitors’. It is used by top-notch online companies like PayPal, Taboola, eBay, and Flipkart.com. It can help you find the best keyword sets to expand your paid and organic reach, and also compare their performance. Likewise, it allows you to measure engagement metrics, web visits, geography, referrals, and traffic trends. It is, in fact, closely similar to Google Analytics, but with a cleaner and more appealing visuals. If you lack the basic tech skills required to tinker with Google Analytics, Similarweb Pro is more user-friendly. However, it has a higher entry price point at $199, compared to GA’s $150 premium plan. Woopra is another web-facing analytic platform in the league of KISSmetrics and Google Analytics. It is primarily a marketing intelligence software that can put sense in your lead generation and customer engagement. Among others, it tracks data in your websites, apps, emails, and other online channels. The feature we like most about this software is its Customer Profile. Heaps of data related to a customer–from emails, support touchpoints, social posts, comments, etc.–are consolidated in a neat identity card and viewable in a dashboard. Although this feature isn’t unique to Woopra, it is not a standard part in even the top BI solutions. So, if your main concern is to get a quick lookup of your customers, Woopra has the tool. We also noted its other key feature, the ability to integrate via AppConnect to optimize data from your CRM, mobile, marketing automation, social, and support tools. 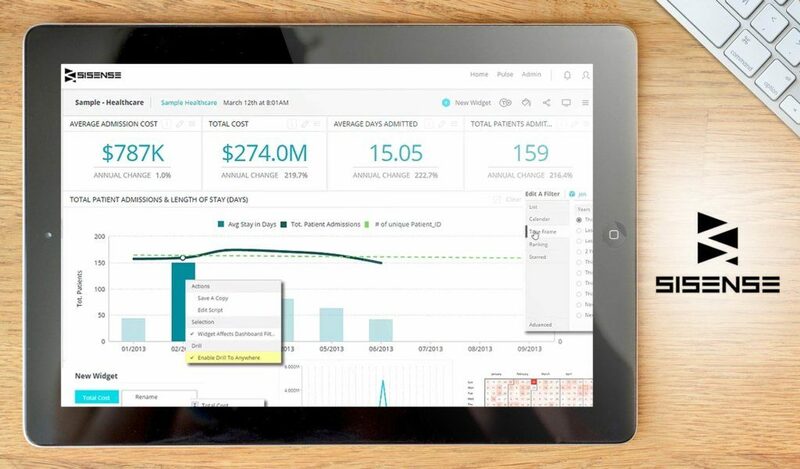 Salesforce Analytics Cloud deserves to be in our top ten BI solutions for its core value: it is built on the Salesforce infrastructure. Salesforce is one of the most widely used SaaS platforms, and we expect many of our readers are using at least of one of its myriad services. For these companies, using Salesforce Analytics Cloud means native integration, where you can surface data and insights faster and more secure. Case in point, we found it easy to use its Wave Analytics to collate data from Sales Cloud. Right away, we spotted low and high peaks of web traffic for a given period. This is a simple test that can be useful in different and larger-scale ways. As part of the Salesforce ecosystem, Analytics Cloud is notable for its mobile access; self-service portal; and share options. As always we’re including five more contenders in our top list. They have specific features that may match your unique scenario. Phocas, for instance, is targeted at large enterprises with complex data. We’re talking about finance and accounts or inventory and purchasing of industries, such as, wholesale distribution, manufacturing, automotive, building and industrial, to name a few. The volume of data across these organizations is extremely difficult to consolidate with disparate business and productivity tools like spreadsheets and documents. Phocas can quickly surface deeply buried data in seconds. In our test, we were able to lock into how many pallets of a specific item were shipped for a certain period that we assigned. This ability has huge potential to play with data and identify seasonal peaks, for instance, or leaks in distribution. You can apply the same tactic across business processes including, profit margins, sales, and prices at a local, regional and global scale. Phocas has all the standard tools of an enterprise BI software for collaboration, communication, document management, and visualization. DataHero is a data visualization solution that enables users to immediately link to cloud-hosted services and import data and generate powerful visuals that are easy to understand and derive insights from. It is so easy to use that it doesn’t require an IT team to set up and get running. With this robust data visualization platform, you can generate charts based on the software’s suggestions or on your own specifications and preferred configurations. This means users see the data they want or need instead of having to go through piles of irrelevant information. DataHero comes with a built-in data decoder that automatically performs data classification and normalization and creates a uniform data repository that is easily accessible yet secure. General Audit Tool is a powerful, user-friendly auditing solution for G Suite users who operate in Enterprise, Education, and Non-Profit sectors. It collects all the information from the user’s G Suite environment and delivers them as comprehensive reports that show all the details, including hidden intelligence that other auditing tools just can’t find. With General Audit Tool, users get access to the most updated data on documents, most productive individuals, most contacted external domains, and more. With all the fact and figures delivered in the most comprehensible and easily digestible manner, General Audit Tool provides users high-value insights that other auditing applications barely scratch. Citibeats is a data analysis and intelligence solution that gathers comments and posts from people from various sources including blogs, online news sites, reviews, forums, and social media networks (Facebook, Twitter, etc.) among others and then utilizes a proprietary Machine-Learning algorithm to filter, evaluate, and categorize all the information to determine the prevailing opinions of the public regarding a particular topic or issue. The software caters primarily to governments and public institutions, helping them gather and know their citizens’ concerns so they can make the most effective and timely response and answers. All these data are presented in easy-to-understand visualizations, allowing Citibeats users to immediately comprehend and derive actionable and highly valuable insights on which they can make smart responses and intelligent decisions. Citibeats offer a variety of ways to interpret mountains of data and deliver them in the most understandable way. Which Reporting Tool Is Best in Market?